About 40 trainees of the secondary school Seomara da Costa Primo (Amadora, Portugal - near Lisbon), where training was carried out, registered in ADEPTT training program. The School Director selected 16 of them, of whom 15 completed the training program. It was easy to engage our audience, since the teachers of this school are accustomed to new challenges and are part of our partner’s network in the Aga Kahn Foundation’s K’Cidade development program. The 15 teacher trainees were from different academic disciplines: Arts (4), English (4), Economics (3), Physics and Chemistry (3) and Geography (1). The training program involved the transmission of knowledge, readings, research and a substantial amount of interactivity between trainees and trainers, as well as numerous practical tasks. The title of the training was “Entrepreneurial Pedagogy”. 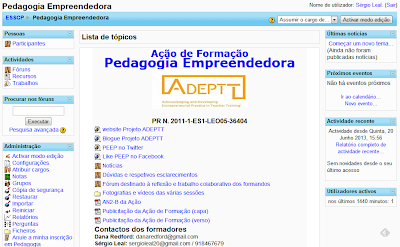 Moodle platform (http://moodle.esseomaracostaprimo.ccems.pt/course/view.php?id=318) was used for training (see next image), where all the information and considerations of the training was located, as well as the proposed bibliography and resources were used. The trainees’ tasks were also delivered through Moodle platforms. The use of Moodle platform was a very enriching experience due to the sharing created between trainer and trainees. The training proved to be very useful. The trainees made frequent positive comments during the training expressing their satisfaction with the themes approached and we could see their interest translated into the results that were obtained. They also referred to the training as a contribution to the improvement of the teaching-learning process and that the Portuguese curricula should be revised accordingly. They felt that Entrepreneurship should be mandatory at the most elementary levels. • Trainers preparation and availability. One of the main positive aspects highlighted by trainers was that the trainees’ attitude was always very positive (even though the time during which the training was given was a busy time period for the trainees). Their collaborative work and discussions in various sessions contributed positively to the exchange of experiences and established contacts for future collaborations. Portugal urgently needs an entrepreneur boost that spreads through schools, adjusting curricula to an education that supports the creation of opportunities, taking calculated risks and the acceptance of failure. As such, there is a need to foster the entrepreneurial spirit, creativity and innovation in all forms of learning, regardless of education level. Teachers assume a crucial role in this mandatory mindset change. Therefore they should have access to basic and continuing training so that they can revisit and make strategic changes in their practices.